Children's clothes are a relatively recent invention. From the rudimentary beginnings of clothing all the way to the nineteenth century, children wore miniature versions of adult costumes. There were a few minor exceptions. Children's clothes often had leading strings sewn in them so the child could be tethered out of harm's way, but the costume itself was still a small copy. Early in the 1800s, fashions for both adults and children became lighter in weight and freer of restrictions. Several popular styles were developed just for children, notably the sailor's suit and the hussar's or Eton jacket. Babies probably had more clothing challenges than any other group. They wore many layers, some of them wool (due to the parents' general fear of colds), two caps were worn with a set for daywear and another for nighttime, and babies even wore corsets or stomach bands. Infants wore long clothes until they were eight months old when the need to crawl and walk made shorter garments more practical. Boys as well as girls wore skirts well past babyhood. In the United States, a wide range of social changes impacted children's clothes. The sewing machine (both home and factory varieties) eased the burden of sewing clothes for the family, and, by the Civil War, paper patterns were readily available for children's clothes. The Civil War itself changed children's garments because standard sizes of uniforms were made for soldiers. Soon, all clothing was sized, and styles for children began to differ because of size ranges. Transportation methods diversified and necessitated new clothing styles. Sports clothes were developed with train travel in mind, and tailored suits for girls and box coats for boys were made specifically for travel. The bicycle and the baby carriage were both popular by mid-century, and clothes for children to wear while riding were created. Dolls and paper dolls became popular toys, and, as the shape of the "baby doll" changed from a diminutive grown-up to a more baby-like shape, costumes for both real babies and their toy counterparts were modified to suit baby's needs. Bonnets as absolutes for American girls also dropped out of fashion when the Civil War eliminated cotton production. By the 1870s, styles had again become very restrictive. Young girls wore laced and boned corsets to shape their waists from an early age even though doctors had become aware of the damage caused to growing bones, circulation, and breathing. Children also wore mourning clothes complete with veils. Girls being sent to boarding school had all the accoutrements of their mothers including fans, stockings, pantaloons, bustles, and feathered hats. Starched clothing appeared neater and cleaner, so shirts and dresses were stiff to the point of discomfort. Changes were beginning to occur rapidly in clothing manufacture, however, as the long centuries of handmade clothes gave way to factory-made garments. Those factory-made garments were also available to any-one with a mail-order catalog. By 1900, fashion began to be a true cultural mirror that reflected war, depression, revolution, the emancipation of women, the evaporation of class distinctions, and the growth of cities and decline of agriculture. Bicycle-riding clothes were extended to girls who wore Turkish trousers. Overalls were initially advertised as bike-riding attire and soon became work clothes for adults; for children, they were called Brownie suits and they revolutionized playwear. The pullover sweater was also created about this time, and open-necked pullovers, turtlenecks, sweaters, and cardigans soon followed for all ages. The changing status of women altered the clothing worn by their children. Women had begun to work outside the home and had less time to make their children's clothing. Children's activities were more liberated, so a wider variety of clothing for play and school was needed. Concern for children's comfort grew as well, so soft and loose nightclothes were just as important as tough-wearing jeans. These clothes had to be easy to clean and durable because mother's time was limited. Surprising developments influenced clothing. Rubber allowed the development of elastic waistbands so young boys could wear trousers instead of skirts. Underwear became more secure and less restrictive, and mother and child saved time when the child could easily pull on clothes rather than waiting for mother and the button hook. Tennis shoes with rubber soles became classic casual wear for this century. Synthetics resulted in wrinkle-resistant clothes, weatherproof garments for outdoors, and soft-spun underclothes. Furthermore, factory-made clothes became less expensive, so a wider wardrobe was opened to children as well as adults. Designs for today's children's clothes are motivated by factors such as ease of laundering, designer-name labels (sometimes worn on the outside of clothes), safety including fire-retardant sleepwear, popularity of TV and sports characters, and adjustability. Manufacture of children's clothes calls for a wide variety of textiles, including specially treated material, thread, zippers and other fasteners, and decorations. Most manufacturers do not make their own textiles although they may have established relationships with textile manufacturers who produce fabrics treated with fire-retardant, ecologically-friendly fabrics and chemically safe dyes, soft or brushed materials for babies' clothes and sleepwear, and other specialty items. Patterns are also required and may be designed and printed in house or provided by suppliers. Body shapes for children are standardized depending on age and weight, so manufacturers rely on other design aspects to catch the attention of the purchaser. In raw materials, these may include lace, pre-made collars and cuffs, pockets, belts, ribbons, frills, trimmings, closings (buttons, zippers, snaps, etc. ), bows, brooches, artificial flowers, knee and elbow patches, and an endless array of other add-ons. Designs are developed around some fundamental concepts. The comfort, safety, and appearance of the child comprise the primary focus; but design approaches to these may vary with the age of the child. Ease of care is also an important consideration. because the most inexpensive and eye-catching outfit won't sell. Durability is important for playclothes and outerwear, whereas uniqueness and decoration help sell party dresses. Seasonal factors influence design, not only in terms of winter versus summer but trends throughout the fashion year. Because many clothes enjoy a second life as hand-me-downs, features like extra-long hems and cuffs are considered in design. Nothing in design is simple whether the clothing item is plain or fancy; details like oversewn seams are selected in design even for cottons and playclothes. Clothing manufacture is completed in several basic processes including cutting, sewing, assembling, decorating, and finishing the garments. The fabric is cut by an industrial saw into pattern pieces. Many pieces are cut at once. wasted. Any one of several types of machines may be used to cut out the garment components. The machine is selected depending on the type of fabric and other considerations. These machines include band cutters that work much like band saws, cutters with rotary blades, machines with reciprocal blades that saw up and down, die clickers that are a form of die or punch press, and computerized machines that use either blades or laser beams to cut. The cut pieces are taken to sewing stations where operators typically perform only one operation on one piece or set of pieces being sewn. The industrial sewing machines vary in the type of stitch they make and the configuration of the frame. Both are factors in the manner in which the machine sews and, therefore, in the part of the garment that can be sewn at that station. Operator A may make only straight seams, Operator B may make sleeve insets, Operator C sews the waist seams, and Operator D only makes buttonholes. Some machines work in sequence and feed their finished step directly to the next machine, while others (called "gang machines") have multiple machines performing the same operation under the oversight of a single operator. 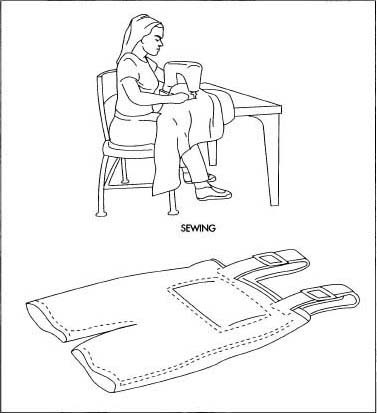 The final sewing step is assembly when all the pieces put together in segments (like sleeves or pant legs) are assembled into the final product. Either finishing or decorating is performed next depending on the configuration of the garment. Finishing may include a variety of steps that manufacturers call "molding"; molding changes the finished surface of the garment by applying pressure, heat, moisture, or some combination. Pressing is a basic molding process, as are pleating and creasing. 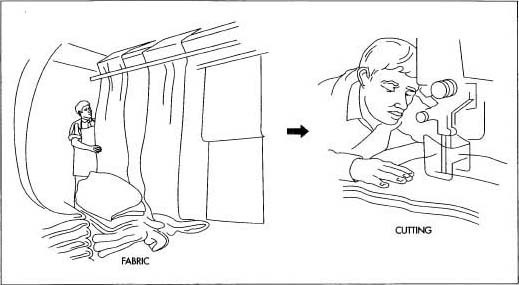 Creasing may be done before other finishing if the finishing involves stitching a cuff; creasing is also done before a decoration, like a pocket, is stitched in place. Other decorations that may be damaged by molding processes, like silk flowers or raised embroidery, may be added after the product has been finished. Completed garments are collected by size and type and are bagged or otherwise packed. For many manufacturers, more care goes into the production of children's clothes than into adult lines. Fabrics and decorations must be chosen for safety as well as appearance, and details like overstitched seams add to comfort for young wearers. The garments are sewn by workers, using industrial sewing machines. Quality is checked throughout the production process; although sewing machine operators may be paid by the piece, their work is inspected at quality stations and rejected for flaws. Machinery is also inspected regularly, and most have shutoffs built into their operation if they run out of thread or perform poorly. Finishing steps are also routinely checked, and, before clothing items are bagged or boxed for sale, a team of inspectors scrutinizes the clothing for loose threads, flaws, and general appearance. In the several centuries in which children's clothes have been specially made for them, children have advanced from being fashion followers to trend-setters. Their tastes in colors, fabrics, designers, accessories, and all aspects of clothing are carefully observed by fashion mavens and copied by adults. Trends now go global in a matter of minutes, thanks to the Internet, and children are attracted to the adventure of changing fashion as well as being as appearance-and comfort-conscious as their parents. Improvements in technology are certainly in the future of all clothing manufacture, but, to spot the latest fashion, keep an eye on your favorite six-year-old. Worrell, Estelle Ansley. Children's Costume in America 1607-1910. New York: Charles Scribner's Sons, 1980. Yarwood, Doreen. European Costume: 4000 Years of Fashion. New York: Bonanza Books, 1975. CAF Textile and Ready Made Clothing Company. http://www.caf-tr.com . The Children's Place. http://www.tcp.com . Spencers Wee Bear Baby Wear. http:llwww.spencers.com/ .